At Happy Earth we support local farmers, sustainable agriculture and environmentally friendly products. Our dishes are prepared with love and always made from scratch. We do not use any processed sugar, faux meats or added added oils. 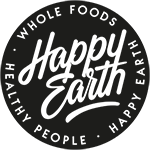 Our menu and the products in our store are allergy friendly for those with gluten & lactose intolerances and suitable for followers of a vegan, vegetarian, oil free, raw vegan or keto lifestyle. Just ask and we’ll be happy to make suggestions according to your diet! Organic production contributes to healthier soil, cleaner air and respects water resources. Organic foods are clean, healthy and nutritious, which is why we use as much organic produce as possible. Raw foods are whole foods in their most natural state. They’re jam-packed with nutrients and living enzymes, which is why we have a whole section of raw options on our menu and in our shop. At Happy Earth we use renewable energy. Our take-out containers are eco friendly & biodegradable, but feel free to bring your own container or cup. In the kitchen we do our best to minimize foodwaste. Can’t finish your order? We’ll be happy to pack it for you!